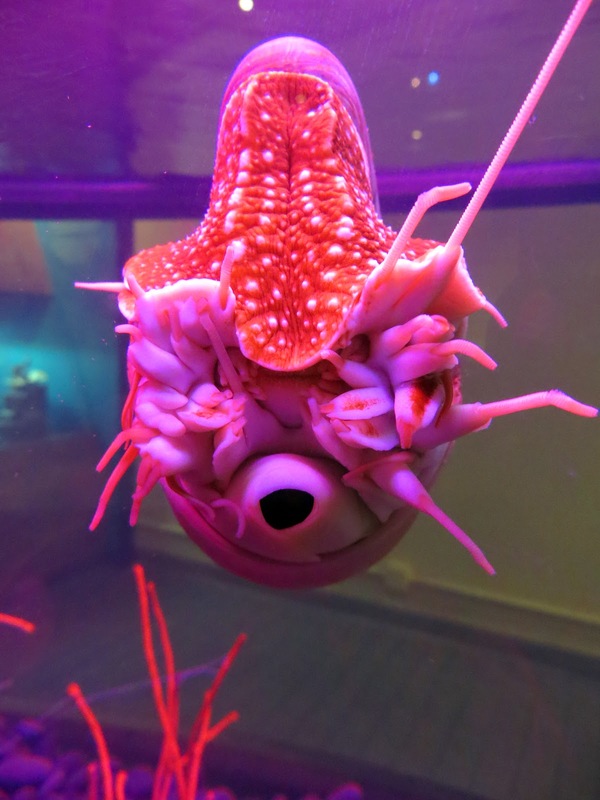 This little guy, the Nautilus, is just one of the pretty and unusual sea creatures we saw at the Virginia Aquarium & Marine Science Center. It has a face only a mother can love. 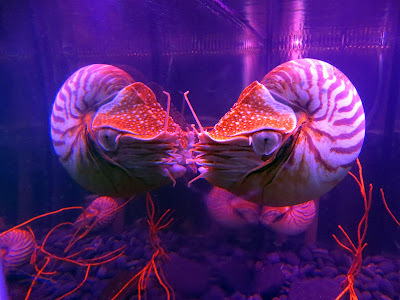 Here's the same Nautilus kissing the glass of the tank, which makes it looks as if he's checking himself out in a mirror. The aquarium in general was just okay. I'm not sure it was worth the $21.00 admission fee, especially since the place was crawling with people pushing SUV-sized baby strollers. I suppose that's expected when you go to an attraction like this on a weekend. When we weren't dodging kids and baby carriages, we were able to see some really cool stuff - huge sea turtles, sharks, a hedgehog, a gigantic lobster, seahorses, and a Komodo Dragon. Speaking of seafood, I just devoured a large bowl of Rhode Island clam chowder and a delicious hot buttered lobster roll! These Nautilus creatures have been around for over 500 million years. They were around before the dinosaurs. If they had eyes and mouths they would look down on humans and say "We will be here after you are gone". And they would be right about that. Oh and their shells look great in an aquarium. Complete best substrate for planted tank relies on –tubes for water intake and a spray bar for the return of the water. When the canister filter is mounted on the aquarium, a siphon is activated. This siphon allows the water to circulate from the aquarium to the filter….